You know those mysterious two holes in a Cervelo or QR PRsix seatpost? Well, this Carrier will fit in there, a nice tight fit. When installed in the high position, air flows cleanly around the aero seat post. The narrow 5/8" SONIC WING chassis has an open back allowing air to exit. This can save 13 seconds per 40 kilometers when in the high position. Because the carrier fits on the seat post we have not discovered any seats that you cannot use including the long Fizik, SMP, Selle Italia, Selle San Marco, Terry and others. 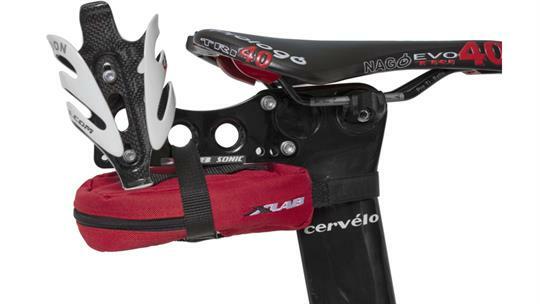 For ISM saddles with a transition hook when fitting to Cervélos the saddle works well if you use the Cervélo clamp in the front hole of the seat post. If you have the clamp in the rear hole, it is necessary to invert the XLAB carrier in order to miss the transition hook on the saddles. 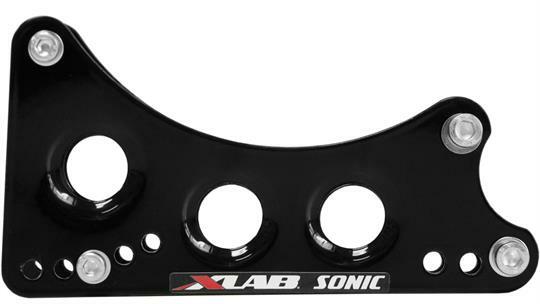 If you do not wish to invert the carrier to miss an ISM saddle, then select either the XLAB CARBON WING, SUPER WING, TURBO WING or MINI WING SYSTEM. aluminium chassis 60 grams, Hardware 35 grams. Straps 9 grams. Because of our engineering and testing for this product, we give it a 3 Year LIMITED Warranty to the original owner.